The European Commission is in practice the government of the EU. Twenty eight Commissioners, one per Member State, are appointed by common accord by national governments. The 29th is the President of the Commission has to be approved by the European Parliament. They are all supposed to be independent and only accountable to themselves. They serve a five year period and cannot be removed except as a whole by the European Parliament - this happened in 1999 when charges of fraud were levelled at the Commission headed by Jacques Santer. Each Commissioner has a portfolio supported by one or more of the 42 Directorate-Generals or Services in a similar manner to national ministries which cover specific areas or policies. The Commission drafts legislation for the Council of Ministers to approve or amend. Commission decisions are taken by simple majority behind closed doors. The Commission and Council form the Executive of the EU. The Commission puts the legislation in place. After approval by the Council the European Parliament can use a system called co-decision to rubber stamp or reject the legislation which applies to most areas but not all. The Parliament cannot itself legislate or write the Budget. EU legislation in the form of directives and regulations is passed down to Member States where governments, including parliaments, rubber stamp these laws. It has been calculated that 80% of national legislation now emanates from the Commission and short circuits national parliaments. Regulations have to be acted upon by all Member States simultaneously. Directives have to be transposed into national law which in theory gives room for manoeuvre, including the date of implementation. Directives include those on the privatisation of railways, postal services and metric measurements. Regulations include those on the liberalisation of the market and subsidies which impinge on free competition. The Commission has the power to ensure this legislation, including Treaties, is carried out and can take other EU Institutions and member States to the European Court of Justice for failures to do so or to settle disputes. One area which the Commission does not cover is foreign policy contained in the Common Foreign and Security Policy (which will be dealt with later in this series). This policy remains intergovernmental and is overseen by the High Representative. The organisation of the Commission consists of 24,000 civil servants and agents and 9,000 external staff. This total is a small number of “civil servants” to run the EU with nearly 500 million people compared to that of Member States. This is because in practice most of the work is carried out by the national civil service within the Member States. When a Member State is president then their civil service bear the brunt of work for six months. It is no surprise that the largest numbers of staff of any Directorate General is that for translation with over 2,000 interpreters and rising with each enlargement. There are 23 official languages and interpreting has to be performed between all pairs of languages largely for paper work. 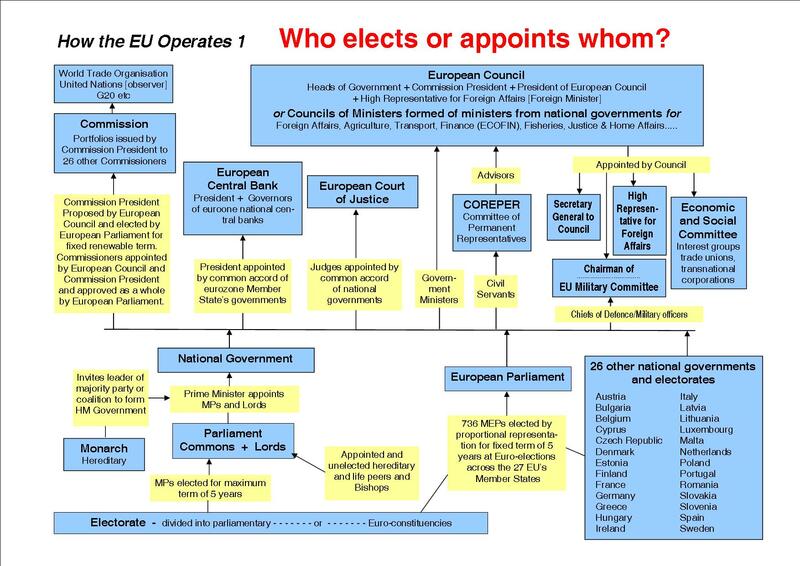 Another body of people associated with the Commission and other EU institutions are the 30,000 lobbyists which in the main represent big business. 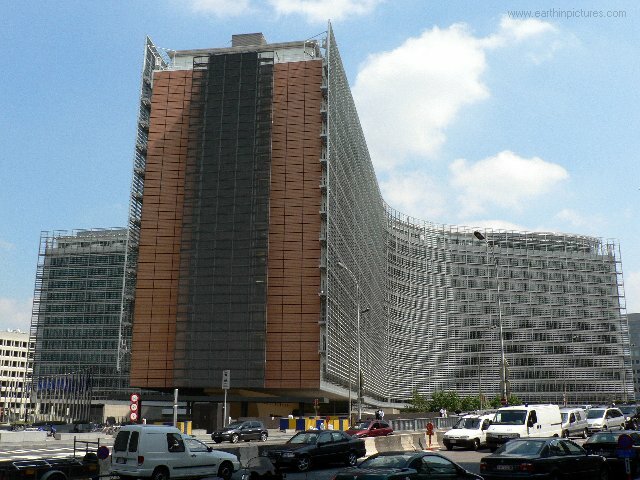 All the transnational corporations have offices in Brussels and they form such bodies as the European Round Table of Industrialists which has major influence on the drafting of EU legislation. 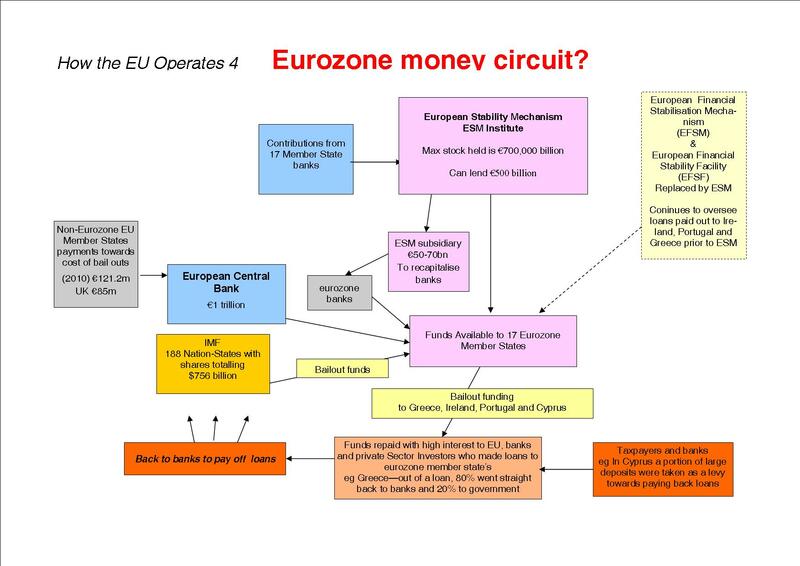 In stark terms the function of the Commission includes overseeing the running of the EU’s single market – for the free movement of capital, goods, services and labour – to ensure everything works in favour of capitalism which is stated to be the only economic system permitted in the Lisbon Treaty. Hence all the directives and regulations. The thrust of the federalists is to have an ‘ever closer union’ culminating in the EU Constitution which enshrines capitalism as the economic system within EU borders and outlaws socialism. The Commission has been given more powers by the Liisbon Treaty (European Constitution)thus eroding democracy further. For example the Commissioner for trade is neogtiating in complete secrecy the terms of TTIP, and associated 'Free Trade Agreements', and other arrangements like ISDS.